Did you know that we provided the precision wireless survey results to calibrate the UMTS network planning tool used by BEN and Dutchtone in the Netherlands to plan their 3 billion Euro 3G network? Cross Country Wireless can accurately measure the wireless coverage of your network or individual transmitter. Our projects range from national networks to a single in-building access point. Unusual projects are our speciality, for example, we recently provided measurements of all broadcast AM / FM / DAB signals at the proposed entrance of a new road tunnel to enable the design of the tunnel radio enhancement system to be finalised. The RST (Radio Survey Tool) vehicle mounted wireless survey equipment developed by Cross Country Wireless uses a calibrated radio receiver (or receivers) to measure the local mean RF signal level of a CW test transmission or customer's radiated signal on any frequency between 0.5 MHz and 2.6 GHz at measured 5m or 25m or timed intervals during a drive trial. The local mean measurement is derived from samples of the RF signal level averaged in linear or logarithmic mode using the Lee criteria. Positional information is obtained from a Motorola Oncore 8 channel or Garmin 12 channel GPS receiver with DGPS correction where required. The survey data is stored as an ASCII text file on a laptop PC. 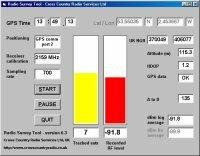 The raw trial data is compatible or can be easily re-formatted to comply with all industry standard network planning tools. The RST backpack mounted wireless survey equipment uses similar equipment to the RST vehicle mounted set-up. 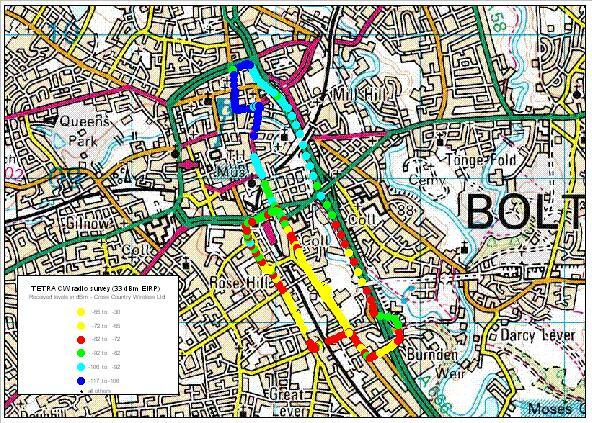 Wireless surveys of pedestrian only areas and in-carriage surveys of railway lines using GPS positioning can be completed and a trial result directly compatible to the RST vehicle mounted radio surveys. In addition, a waypoint positioning system allows in-building wireless surveys to be made and plotted on the building plan. The waypoint positioning system can also be used with the RST vehicle mounted equipment for wireless surveys of road tunnels and other underground roadways. Contact Email address hidden from spambots for more information.